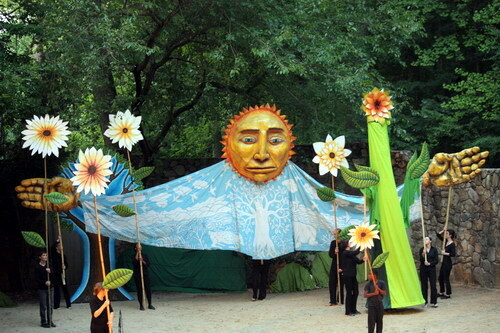 The current production of the amazing Paperhand Puppet Intervention is one of our favorites among the nine and counting we’ve seen. 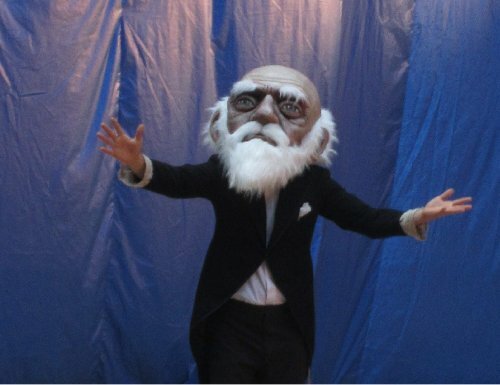 “Invisible Earth” features a Charles Darwin character fast-forwarding through evolution with a message of peace, love, and stewardship — the usual lofty Paperhand themes. As always, Paperhand’s visuals amaze both children and adults. 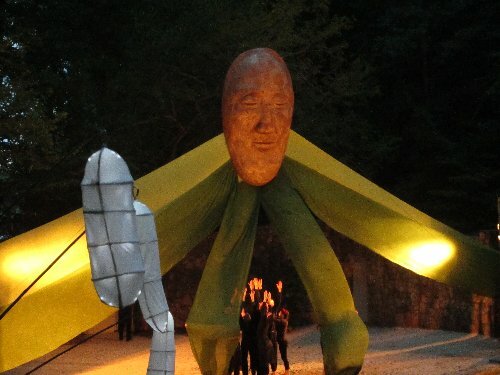 This year’s include dancing amoebas, barnyard animals, funky monkeys, a huge elegiac mask with outstretched arms, and a humanoid assembled with Japanese lanterns. 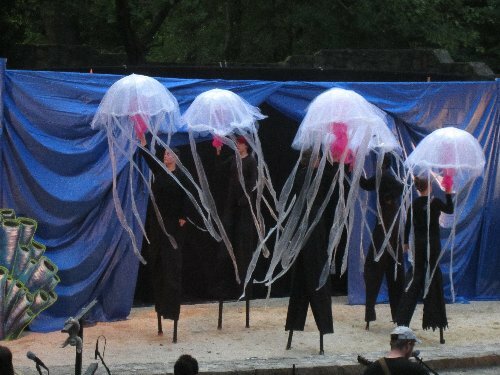 Several times throughout the 90-minute show, cast members glided the stage waving huge strips of fluttering fabric hanging from bamboo poles, sometimes sending the caressing cloth out over the audience. Truly poetry in motion. Another highlight this year: gorgeous, searing music composed by Ari Picker (Lost in the Trees) and, as always, performed live by the Paperhand Band. Below are a few of our favorite images. But please, go see for yourself! 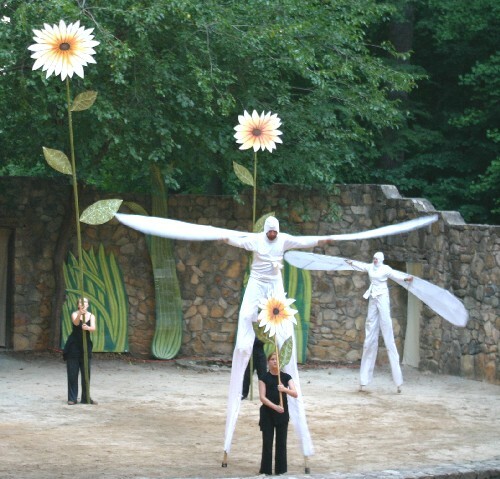 Paperhand will be at its annual summer home, the historic outdoor Forest Theatre on the UNC Chapel Hill campus, through Sept. 8, and then at the NC Museum of Art amphitheater Sept. 13-15. 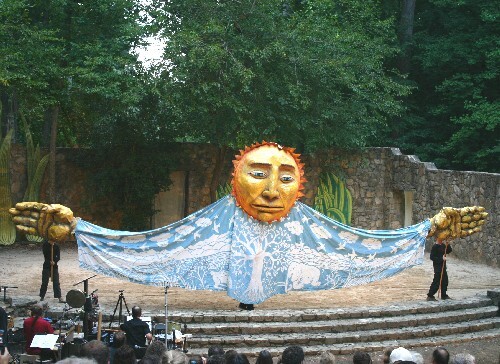 The Sun Goddess is one of our favorites. 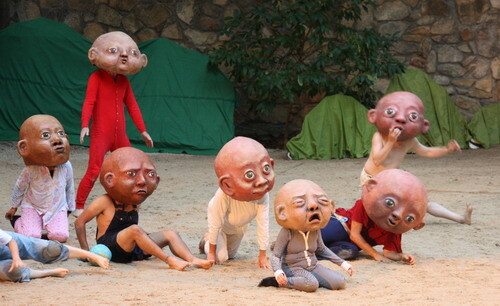 Poignant and hilarious was "We Are All Just Babies," no matter our age. 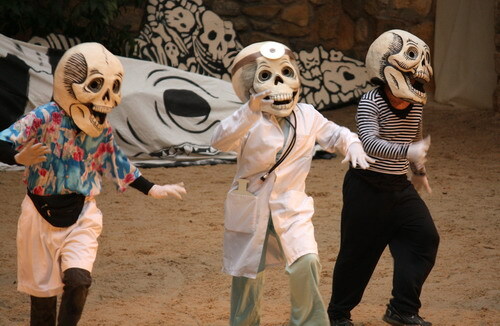 Paperhand always turns a little dark, as in this macabre death dance. These creatures are athletic and technically challenging. 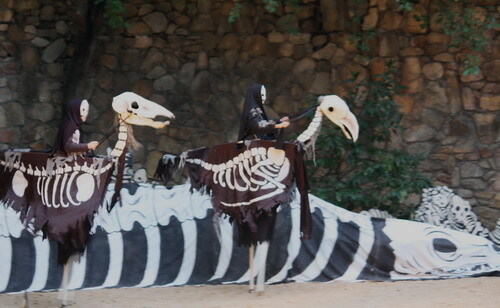 The "riders" are on stilts and their horses/birds (?) buck and stomp. Amazing. 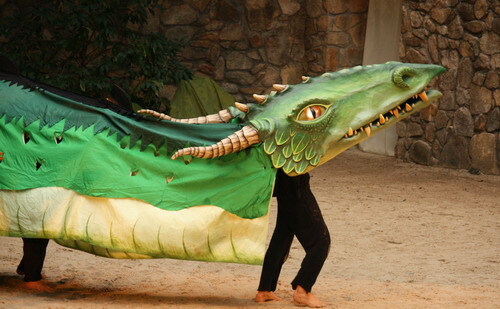 Eleven puppeteers operated the serpent, which has a ferocious roar. Paperhand cofounder Donovan Zimmerman steers the serpent toward the outreached hands of mesmerized children. Magical and moving. When I first heard about Paperhand, my eyes glazed over. Puppets? Not my cup of chamomile. But after enough People I Trust told me it was the coolest thing ever, I succumbed. My review: Coolest Thing Ever. I want to take everyone there, but since I can’t, I’ll just tell y’all about it. 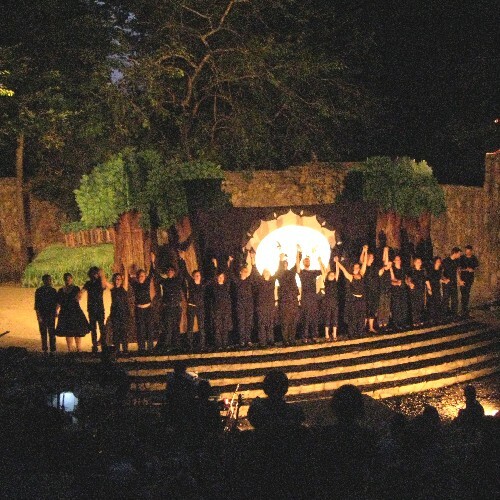 And, please, if you ever visit our neck of the woods, try to catch a show by one of the most creative artistic groups you’ll find anywhere in the world. To whet your appetite, check out their videos and photos online. If you need a ride, let me know. First, the “puppets.” They’re huge, breathtaking, soulful, gorgeous. 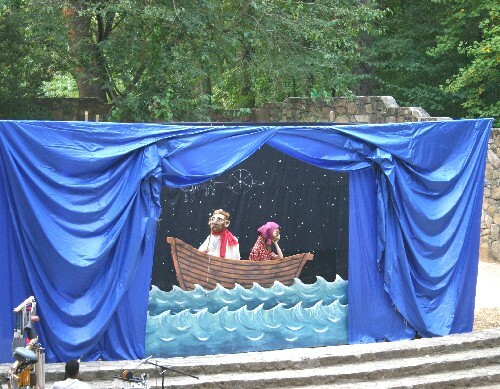 Also onstage at various times: giant masks, stilt dancing, rod puppets, shadow puppets and more. And a wonderful live band accompanies them. 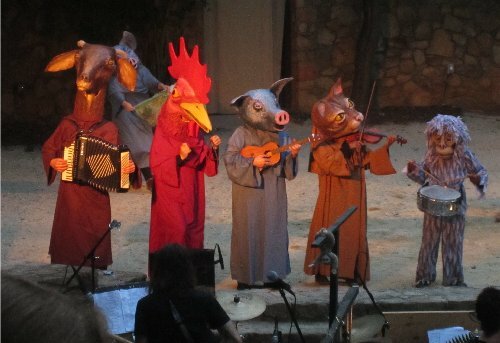 The puppets live at Paperhand’s home (secured this year!) in Saxapahaw, a former mill town being reborn by creative types. Second, the stories. They often start with an epic myth (this time the Babylonian creation epic) played out violently and then transforming into scenes of peace, love, social justice, etc. Yes, the audience is hit over the head with this stuff, but it’s OK because it’s all true and real and wonderful and you just want to have a giant group hug by the end. There are always (I think) four acts. 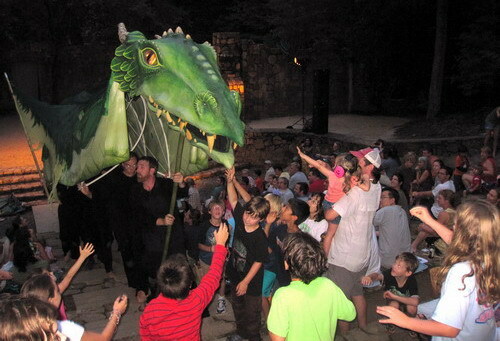 The third ends with the biggest puppet/creature (carried forth by several people) going up into the audience to be touched by adoring children in the crowd. 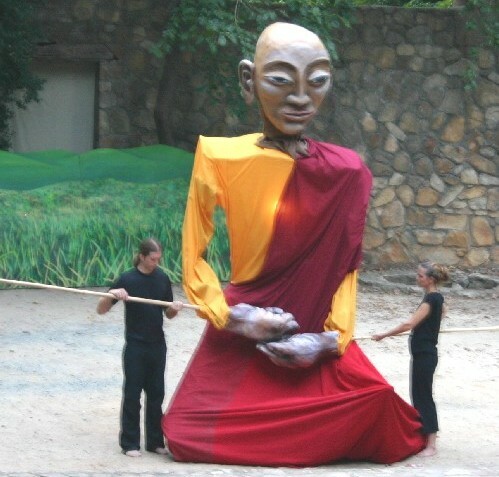 The first year we went, in 2006, the star was a heart-achingly beautiful 20-foot Buddha. This year it was a lion. But it was so much more than that. 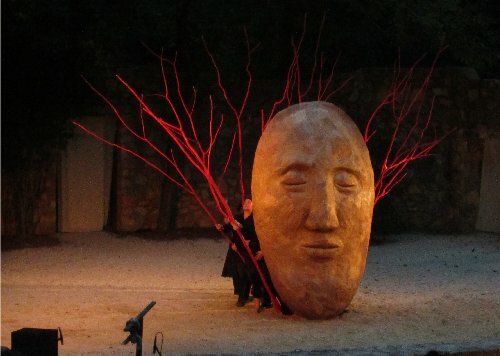 This year’s 10th anniversary show, “The Living Sea of Memory” (in the area through Sept. 12), is dedicated to Kevin Brock, the band’s drummer and dear friend, who died last year at the very early age 37. There has been a huge outpouring of love for this man who illuminated many people’s universes. The lion in the performance is Kevin. 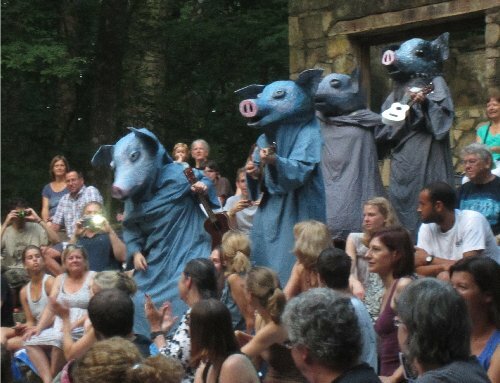 It comes through the crowd after the act called “Memory,” in which family stories (from the cast) are shared through the puppets. I think I would have cried anyway, but after losing my mom this year, those stories tore me up. 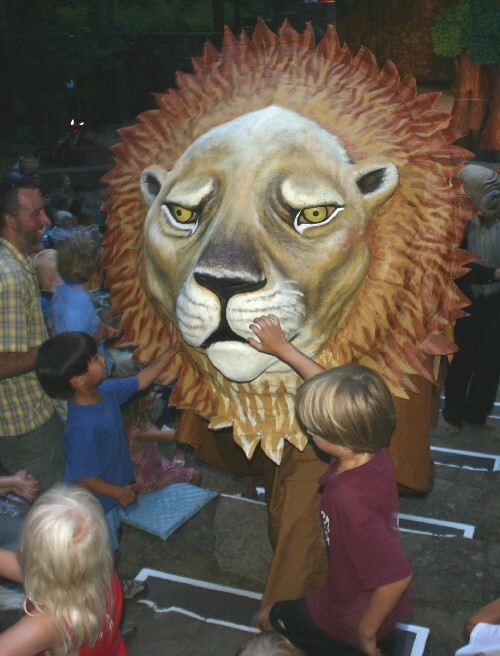 When the lion came lumbering up the stairs of the wonderful Forest Theatre amphitheater, children rushed up, hands reaching out to touch him. Pure magic. I read today that several of the shows on this current tour have been rained out, which means less money for the troupe. I don’t expect you to read this and send in a little tax-deductible donation to help cover Paperhand’s rent, but you’re certainly welcome to. And please try to see these amazing artists and activists. They are the change they wish to see. HEY, ma, look at this HEMA site!